Welcome to our fourth installment of Cooking With Kids. My kiddos are attempting to make some of their favorite selections out of Southern Living: Kids Cookbook . This time they attempted Caramel Chocolate Pretzel Sticks. If you've been following along in our culinary adventures, you'll know that we only use the recipe as a guide. We often change things. We'll give you our changes, but you'll have to find a copy of the cookbook for the actual recipe (page 20). Unwrap the caramels. Let the kids each eat one (see Scooter's mouth!). 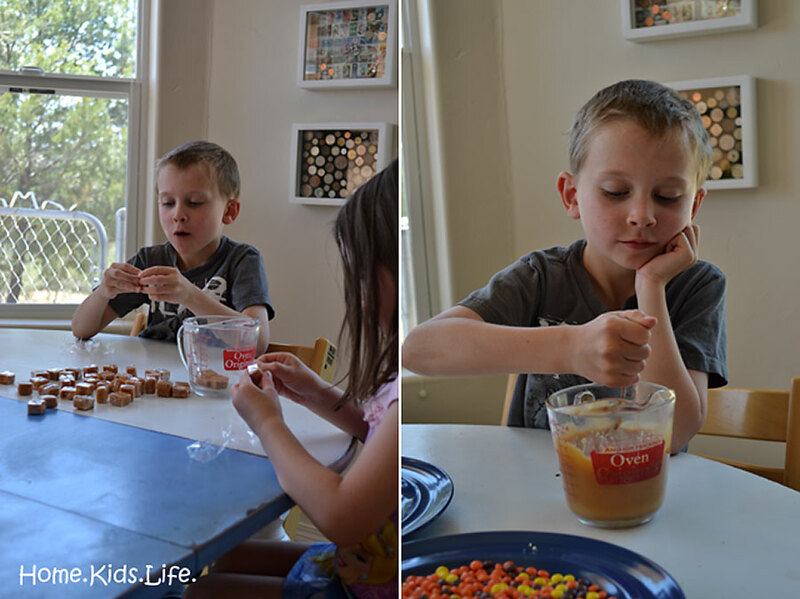 Put the caramels in a microwave safe bowl (we used a glass 2 cup measuring cup) and add 2 tablespoons water. Microwave on medium-high power for 2 minutes or until caramels start to melt. (Tip - I used the chocolate melting button on my microwave and that worked fine.) Stir caramel mixture until smooth. Dip a pretzel rod into the melted caramel. It helps to use the 2 cup glass measuring cup or another tall glass. 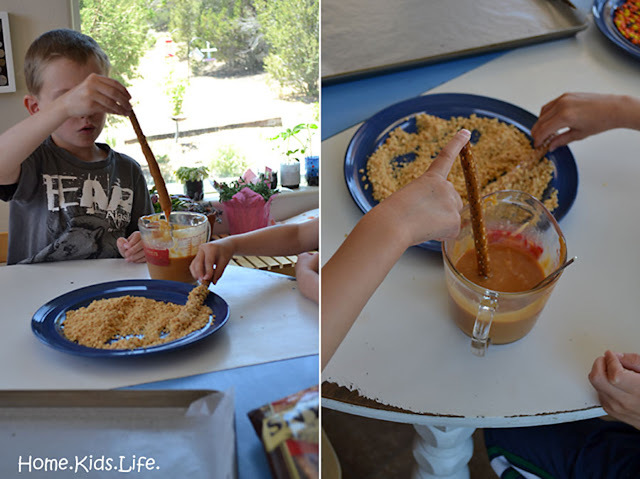 We sometimes used a spoon to help push caramel up higher on the pretzel rod. Let excess caramel drip off or wipe it off with a spoon. Roll the caramel coated pretzel in the peanuts. Place on wax-paper lined baking sheet. 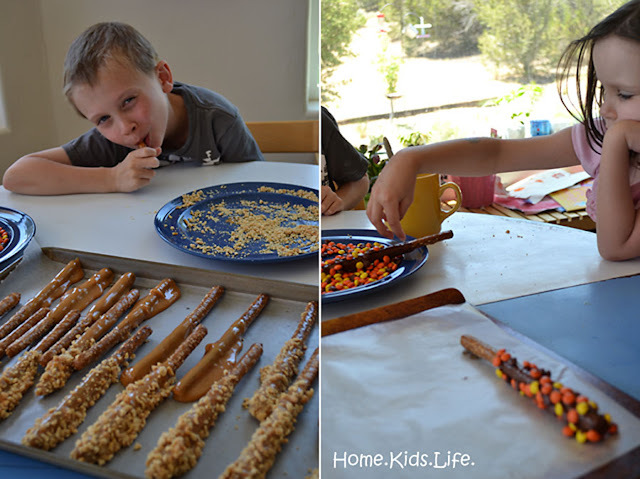 If you run out of peanuts, just dip some pretzel sticks in plain caramel and forget the nuts. Melt 1 cup chocolate in the microwave. Dip some pretzel sticks in chocolate and then roll in mini Reese's Pieces. Let the kids eat broken pretzel sticks while you place the coated pretzel sticks in the refrigerator. Let the caramel covered ones chill for 10 minutes. Melt 1/2 cup chocolate chips in microwave. 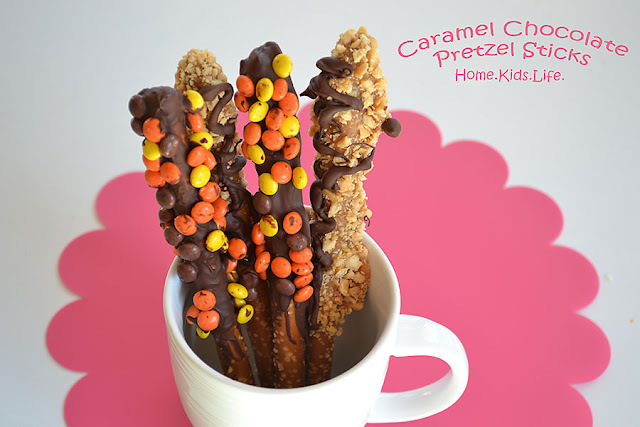 Place melted chocolate in a baggie, cut a corner, and then drizzle chocolate on caramel covered pretzel sticks. Store in refrigerator. Yummy! Enjoy those special treats! I didn't even get any picture of my kiddos enjoying them. And I know their Daddy enjoyed them. These were fun to make, but messy! 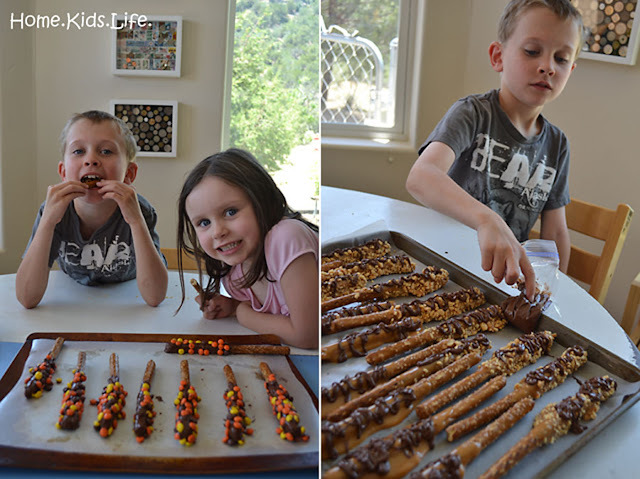 An even easier chocolate covered pretzel to make is Super Easy Chocolate Covered Pretzels. We make those during the Christmas season for treats quite a bit. 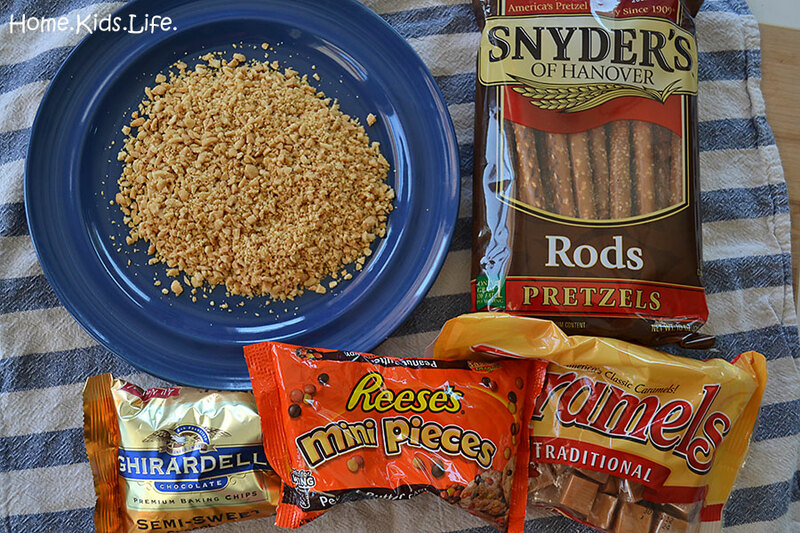 What do you like to put on your chocolate or caramel covered pretzels?